My husband and I recently completed our first-ever cross-country road trip together, driving eastbound on Route 50 from San Francisco, CA to Ocean City, MD. After logging 3,889 miles (including detours) through 13 states, plus the District of Columbia, and an astonishing array of landscapes, here’s my Top Ten learnings. #1 – Always check multiple sources before booking a hotel room. Before our trip, I sketched out a tentative schedule for each day, including potential hotels. We then booked rooms each night on our trip for the next night. The night before we drove to Grand Junction, CO, we found a great deal on-line at the Historic Melrose Hotel, which was mentioned in my guidebook, but was not the one I chose for my itinerary. Not remembering why, we booked it. The Historic Melrose Hotel, which looked lovely from the outside and was in the quaint Old Town section, turned out to be affordable housing for low-income residents – one step up from a homeless shelter. Which explained the great price. Had we checked TripAdvisor (or had I remembered what I learned when I checked TripAdvisor three weeks earlier) we would have been more educated consumers. Instead, we parked the car below our room and spent the night half awake listening for sounds of a break in. Since we were on a fixed schedule going eastbound, we didn’t make too many stops, so I became marginally competent at taking photos from inside the car through the windshield and side windows (with attendant glare and reflections), avoiding the radar detector and GPS and rear view mirrors, at 55-65 mph. My husband would suddenly blurt “There!” and I was expected to instantaneously (1) figure out what he was talking about and (2) take a great photo of it. He would often say, “Oh, you were too slow” or “Did you frame the picture with the trees?” to which I would always reply “Got it! !” (my strategy being that whether I got it or not he would never remember). I learned where the “sweet” spots were on the windows (and some contortionist positions that worked well) and learned to take multiple photos that I would go through each night to weed out the best shots. I relied heavily on the photo editing tools in the iPhone – as long as I got the subject somewhere in the photo, I could enlarge and crop and lighten. Even so, in addition to a few good shots, I have an impressive library of blurry, blank, and unidentifiable transcontinental pictures. My photo of the Iwo Jima Memorial in Washington, DC looks right out of “The Blob” (my favorite vintage horror movie). Because we didn’t make too many impromptu stops along the way, our lunch breaks were a highlight of each day. Sometimes we were tempted to power through without lunch, but I’m glad we didn’t. First, they provided a much-needed respite from the car and driving. But more importantly, they were consistently fun. We tried to find little towns and older restaurants characteristic of Old Time America. We learned about the towns we visited by chatting with the waitresses and proprietors that we encountered. 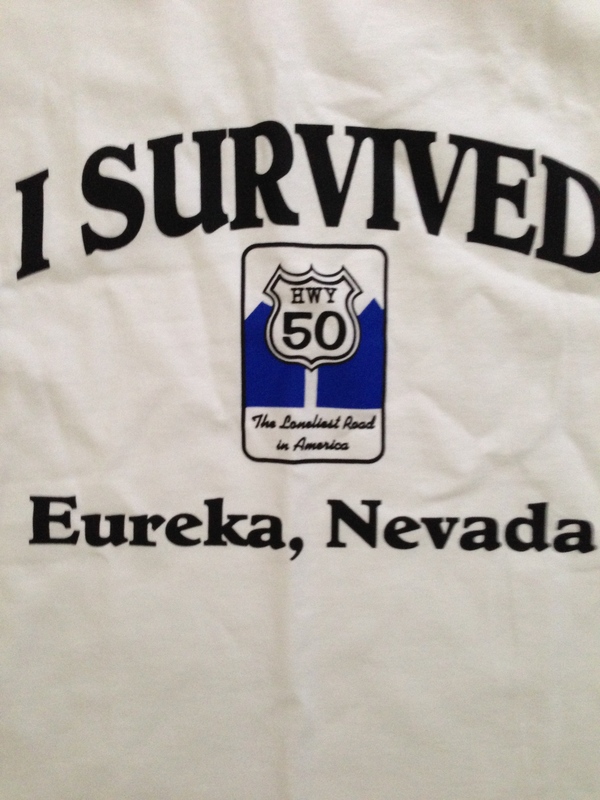 In Eureka, NV (Pop 610) our waitress told us she had 17 in her graduating class in high school. She said her school offered all the usual sports, but every student had to play most sports in order to have enough players to field teams. In Olney, IL (pop 7.994) , home to a colony of albino squirrels, our waitress instructed us that the best way to see squirrels was to visit the city park with McDonald’s French fries. We spent 12 days traveling across country, but two of those were rest days. On one rest day, we visited dear friends in the Denver area. On the other, we visited my brother in St. Louis. While in Denver, we had two home-cooked dinners, slept in a quiet comfortable room on a super-comfy bed, took a leisurely tour of the local area, and caught up with our friends. In St Louis, we were also fed and put up in our own cozy room, and got precious quality time with family we don’t see often. Although my husband initially questioned the need for rest days, we later agreed that they really helped us recharge and get back on the road fully energized. Our Chevy Traverse has a built-in GPS system, which we have found to be rather clunky. We’ve had to learn multiple workarounds to get it to do what we need. Therefore, we also travel with our portable Garmin as back-up. In a pinch, I also fire up Google Maps on my iPhone. And of course, there is the iPad. There were many days when I joked to my husband that he was in the unenviable position of driving with 4 women (including me) telling him where to go. And even with all the help, the Navigator was still a full-time job for me and I had to know where we were at all times and not rely on GPS. Since we were trying to stay on Route 50 (not necessarily the fastest or shortest route) I had to learn tricks to outsmart the GPS (with waypoints, etc.) to get where we wanted to go and mediate disputes between the “women” (our GPS systems). But then there was the time we drove right by the bank that was just down the street from our hotel because were so busy fiddling with the GPS rather than just looking at the address. Even with all the gadgets…. Before we left on our trip, I visited the local AAA office and picked up 3 bags of maps and tour books, covering every state we intended to travel. Thank goodness, because we would otherwise have been at the mercy of our GPS systems and probably lost somewhere in Kansas. It was essential to get a sense of the route before programming the GPS, plus it was more meaningful to follow along on a map as we drove. The maps told me more details about what we were seeing (rivers, mountain ranges, etc.) so I could act as self-appointed Tour Guide. #7 – Don’t travel with just one big heavy suitcase. We retrieved our luggage sets from the garage before we left, and packed our big suitcases since we would be gone for an extended period. We had every intention of bringing along the smaller weekend bag or the smaller roller bag that went with our sets, but for some inexplicable reason we forgot them. As a result, every night as we checked into a new hotel (always requesting a second floor room) we found ourselves lugging incredibly heavy suitcases with everything we owned out of the car, across the parking lot and up the stairs. Then our room (being typically Comfort Inn rather than Ritz Carlton) was almost completely filled with suitcases. We looked like the Kardashians, or more the Beverly Hillbillies, checking into town. After a couple nights of this nonsense, I started using an empty tote bag I’d brought along to pack one or two nights’ provisions so I wouldn’t have to mess with the Two Ton Suitcase. I will definitely bring that weekend bag along next time, in addition to the Big Suitcase, and plenty of tote bags for flexibility. After about Day 4 or 5, I couldn’t tell you with any conviction where we had been even the day before for lunch. It all became a blur. I found the written itinerary listing all of the lunch and dinner stops and hotels very helpful, and I learned to note any changes or any additional sights we saw along the way. That way, between the photos and the itinerary, I should be able to reconstruct a decent memory book of our trip. This trip was a little too much driving with too little sightseeing for me. Since we were on a fairly strict timetable, we didn’t have much time for spontaneous exploration of sights and attractions along the way. There were a few unscheduled stops we made – to see the remnants of an old pony express station in Nevada (or was it Utah? )- that were interesting, but for the most part we simply saw what we saw from the car along Route 50. On our next trip, along the old Route 66, we plan to meander more. The trip did give me ideas, however, of places to return to see (Kansas City, for example) in more depth. Driving through the entire middle of the continental United States was a thoroughly amazing experience. The vast and varied landscape, from the barren desert of Nevada to the rugged mountains of Colorado to the great plains of Kansas to the lush West Virginia countryside, simply took our breath away. There were days that we turned off the radio and sat in silence taking in the magnificent beauty of the scenery before us. We so enjoyed our encounters with the people we met in small towns across the country. We will never forget the day we smugly stopped for a photo of ourselves at Monarch Pass (elev 11,312) at the Continental Divide in CO and we met two young men who had RIDDEN THEIR BIKES from San Francisco. We emerged from our trip more in awe of the spirt and beauty of this extraordinary nation and its people. And…we’re off!!! On the Great American Road Trip. Our first night was spent at my sister-in-law’s house in the Bay Area. The next day we crossed the San Francisco Bay Bridge and drove to Sacramento, where at twelve noon, ON THE DOT (not planned, but how dramatic!) we hit the start of Route 50 and the Official Route 50 Road Trip began. From Sacramento, we drove to Fallon, NV. Our scheduled lunch stop was in South Lake Tahoe, CA at the Red Hut Cafe. The Guidebook urged a stop here at the circa 1959 cafe – the original of several locations. As we pulled up, the neon “Open” light suddenly switched to “Closed” and my heart sank, worried this did not bode well for our trip. I pulled out my iPhone ready to locate another restaurant, when I noticed 3 women milling about in the café and jumped out to talk to them. These incredibly friendly women (who worked there) informed me that the café just closed but there was another Red Hut right down the street, which was still open. We proceeded to the other Red Hut and had a lovely lunch overlooking Lake Tahoe. After tooling around stunning Lake Tahoe a bit, we continued to Fallon for the night (crossing the Nevada border at 3 pm ON THE DOT). Up to that point, I hadn’t covered any new ground. Beginning in Fallon, I saw new sights, including the Fallon Naval Air Station (which hosts the Top Gun school) where my son may be stationed someday. Also beginning in Fallon is the stretch of Route 50 dubbed “The Loneliest Road in America.” By the end of that day, we completely understood the moniker. 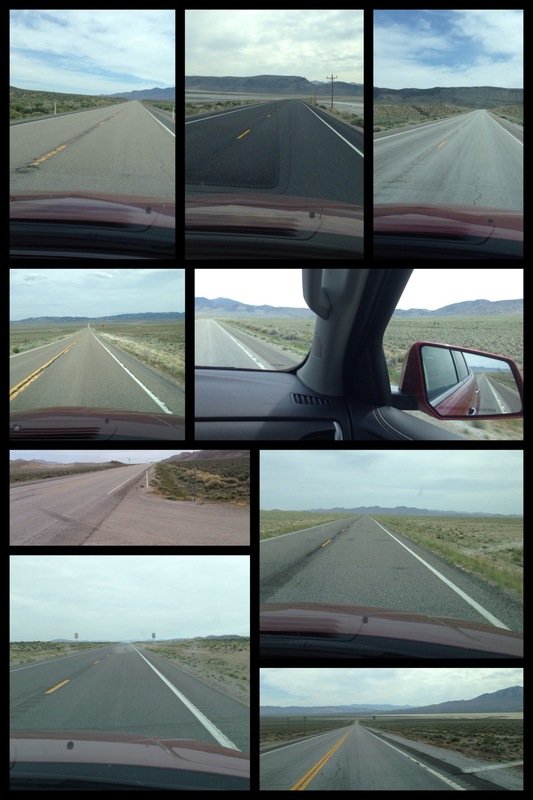 Between Fallon, NV and Delta, UT, we encountered 410 miles of generally straight road, sagebrush, mountain and blue sky. We rarely saw other cars or people. There was no Internet coverage. Our lunch stop was in tiny Eureka, NV, where our waitress told us that her entire graduating high school class consisted of 17 students. While the school offered sports, the students had to play all of them to field enough players for the teams. The scenery was striking, but hour after hour of relative uniformity became monotonous. I amused myself initially by taking pictures with my iPhone. 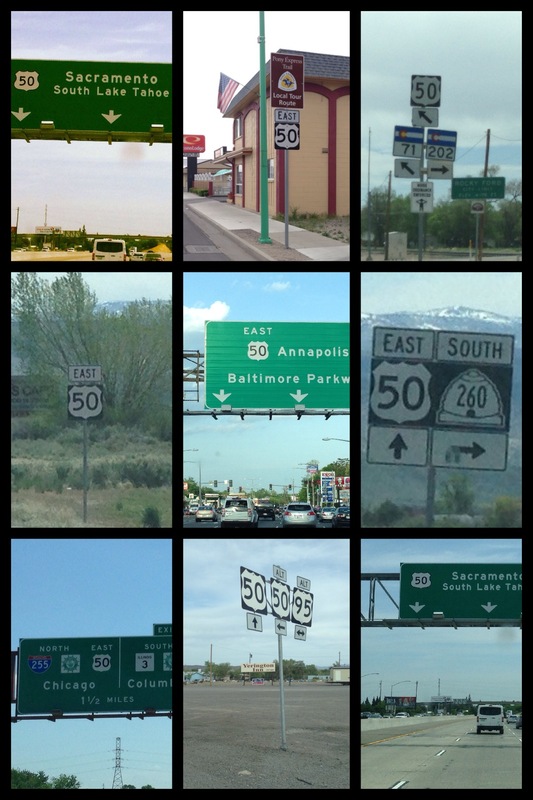 After 30 or 40 landscape photos looked identical, I switched my focus to Route 50 signs. 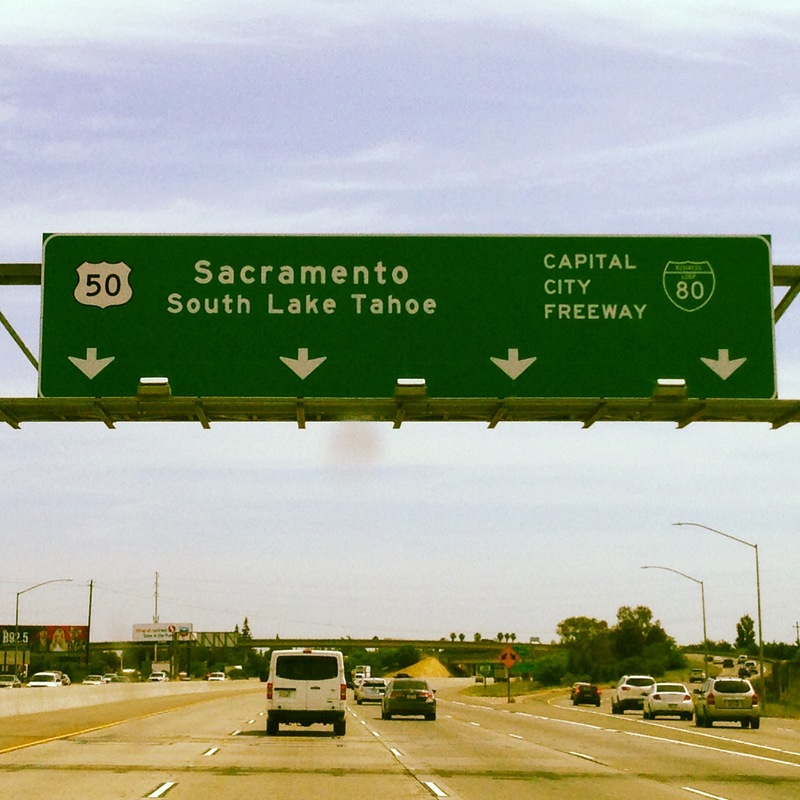 I found myself increasingly dazed, and the Route 50 signs snuck up on me. It was not easy taking clear photos at 70 mph through the car window or windshield, with the reflection and the GPS and radar detection in the way. Add my trance-like state, and dull reflexes, and an extensive library of blurry Route 50 sign photos resulted. My next coping mechanism was my Easter chocolate. After 6 dark chocolate eggs and a marshmallow patty, I felt alive again with the sugar coursing through my veins. After a couple more hours, however, the blood sugar plunged and fatigue really hit us. So we reverted to our secret weapon – Disney songs. For the next few hours, we sang along with our entire Disney Collection at the top of our lungs. From Sleeping Beauty to Jungle Book to Mulan to Pocahontas, we sang all the parts, amazing ourselves at our mastery of the lyrics (from all those years of Disney music when our son was younger). We came alive! We had fun! We were silly! Thanks to chocolate and Disney, the Loneliest Road in America turned out to be anything but, and a surprisingly splendid start to our Great American Road Trip. We have been planning a cross-country road trip for quite some time. 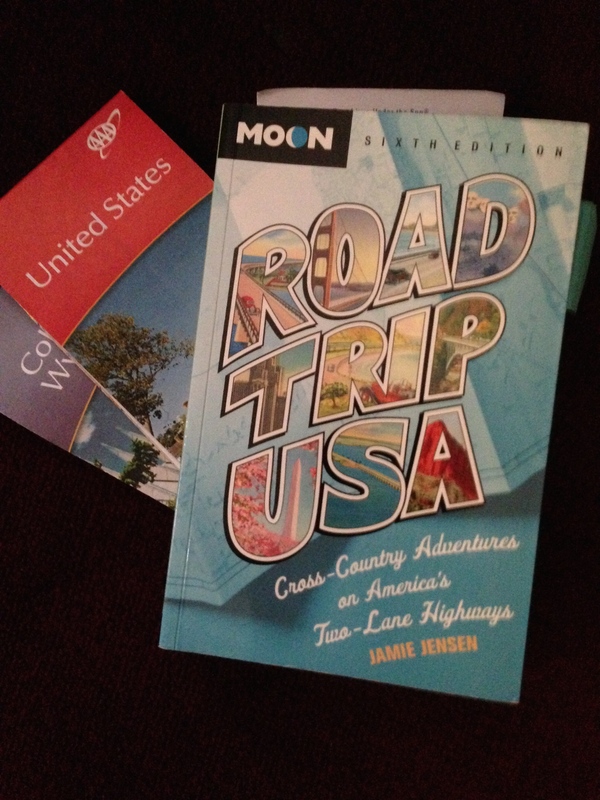 It started with a proposed trip to my brother’s house and morphed into a Great American Road Trip. And then it almost broke down before we left the garage. Our projected itinerary follows Route 50 eastbound and Route 66 westbound. I initially wanted to drop some things off at my brother’s house in St Louis, and then we decided to keep going to Annapolis to visit our son. And since we have to get home, we decided to do the return trip via Route 66. Then we added a couple of stops with friends and family…and viola…our delivery trip became a national expedition. Last month, I spent two full days sitting (without moving) at the dining room table with my laptop planning the itinerary and stops, complete with hotels and lunch and dinner spots. I scored 2 bags of maps and guidebooks from AAA, and my husband ordered me a complete Route 66 library from Amazon so I consulted piles of maps, books and guides in the process. My husband also found some guy on-line who plotted and posted the coordinates for Route 66 on his Garmin, so my husband was in charge of plotting our exact driving route and making our hotel reservations. As of 3 days before we were scheduled to leave, I noticed that the hotel reservations hadn’t been made. Which wasn’t critical, since we could always make them as we went. Two days before we were scheduled to leave, I finished my packing list and all that was left for me was the actual packing. I glanced at my husband’s To Do list, and noticed it was two pages single-spaced, including the laundry. Then disaster struck. Two days before we were scheduled to leave on our trip, we returned home late that evening from a family event. I remarked that the house seemed rather humid, and I was getting ready for bed when my husband rushed in, looking like a doctor with a grim prognosis. He stated very seriously “We may have to delay our trip. I’m serious.” He went on to explain how he had discovered a broken pipe under our house that was spraying water in the crawl space. The most worrisome part was that this probably had been going on for a while since we had heard a mysterious whooshing sound coming from below our dining room for months. We were concerned about mold. I started researching mold and water damage, and then flights to Annapolis. My husband turned off the water (no laundry!) and decided to call the plumber first thing in the morning. We woke up at around 6:00 AM and drove 1 block to the YMCA to use their toilets (I told you the YMCA membership was a lifesaver). After we called the plumber, the pool guy showed up. I only heard part of the conversation but some important “cell” was broken and in need of repair or replacement. At that point, I decided what would be the most helpful was for me to return to the YMCA for my Gentle Yoga class. I also did what I am getting much better at since I retired – I turned the entire situation over to God and decided I would be at peace with whatever outcome, which was looking less and less like an extended road trip. Two hours later, I returned from yoga to discover that my heroic husband had everything under control. The pipe had been repaired, there was no evidence of mold, the pool part was ordered and the washer and dryer were going. He had made arrangements with the plumber, pool service and our house sitter to have everything handled while were gone. When I asked if he thought we would still be able to leave, perhaps a day later (since with all the house problems I assumed the To Do list still needed tackling), my husband informed me that we would be able to leave right on schedule. And we did – having begun our adventures before we even left the house.